Sometimes simple is better. This is the kind of business video you could do for your clients. It’s effective and relatively easy to produce. There’s no fancy graphics or After Effects work. A simple sound track with VO and one instrument music. Most of the lighting was available light. But just because the video seems to have simple production values, it is not low quality work. This is very well produced. It might very well have been done by one person plus a narrator. A great business video does not have to be complex or expensive. Didn’t you love that yellow lab puppy at the end? 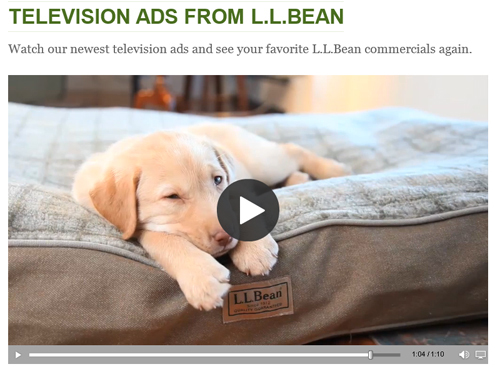 He’s dozing on an LL Bean dog bed and making a testimonial at the same time. This video appeared on the LL Bean website after I made a purchase. They had already made the sale, but they just wanted to make sure I left feeling I could trust their company and products. So I’d buy again and tell my friends. It worked! Years ago I had a contract to produce TV commercials for a large pet food store. Their ad agency came up with a number of boring and expensive commercials. I didn’t think they would sell pet food, but I was not the agency. After we produced those spots and saw their disappointing results, I told the owner of the store I thought the commercials should not be about pet food, but about love. Let’s film puppies and kittens with music and nothing more than the store logo and location. He said he’d give it a try. This was so successful, I spent the next year or so looking for puppies and kittens I could film for these commercials. It was fun to do, but I learned that you need a very cooperative pet owner and a nice-looking but confined space to film the fun-loving, rambunctious puppies or kittens. Expect a very high shooting ratio. People wrote to him raving about the commercials. Some wrote that they loved the commercials and didn’t even have pets! To learn more about producing business videos, see Professional Video Producer.